U.S. Ambassador Terry Branstad shakes hands with Chinese President Xi Jinping at the Great Hall of the People on Sept. 30 in Beijing, China. U.S. 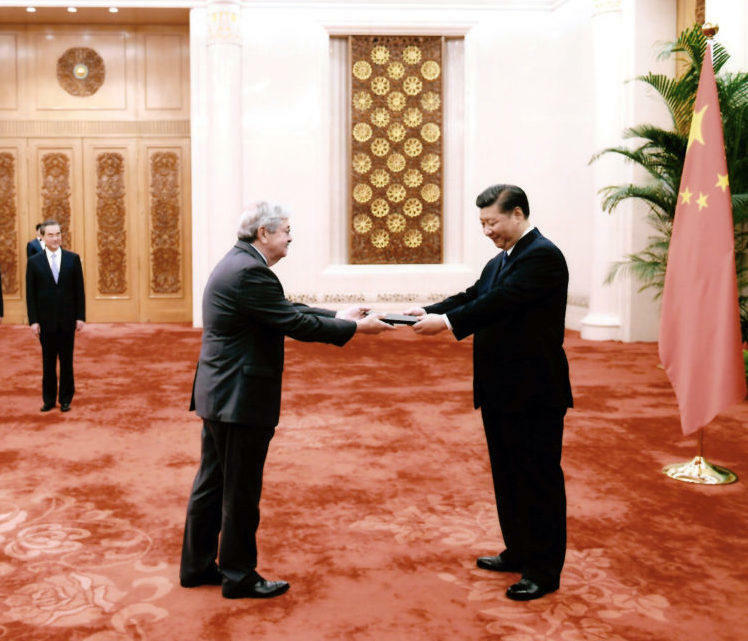 Ambassador Terry Branstad presents his credentials to China's President Xi Jinping, July 12, at the Great Hall of the People in Beijing. The year was 1985. Terry Branstad was in his first term as governor of Iowa. A county-level Communist Party functionary in northern China's Hebei province was leading an official delegation to his "sister state" of Iowa. That party official was Xi Jinping, now China's president. "I was impressed with him and his group from the beginning," Branstad says in an interview at the embassy. "They were friendly, and they were from our sister state, so we wanted to treat them well." Xi rode a boat on the Mississippi River, Branstad recalls, visited local farms and factories, and experienced residents' hospitality. "He said, 'when I think of America, I think of the wonderful people I met in Iowa in '85," Branstad continues. "And he calls us old friends. So that's important in the Chinese culture, long-term friendships." Branstad went on to serve five more terms, the longest tenure of any U.S. governor. He supported Donald Trump's run for the presidency. The then-governor's son Eric Branstad ran the election campaign in Iowa. Xi, meanwhile, rose through the ranks to become the head of China's ruling party, state and military, and is now widely seen as the country's most powerful leader in decades. "Who would imagine that a young man that came leading an agriculture delegation to Iowa in '85 would someday be the leader of China," Branstad says, smiling. One of the biggest payoffs of this special relationship, according Branstad, is access. 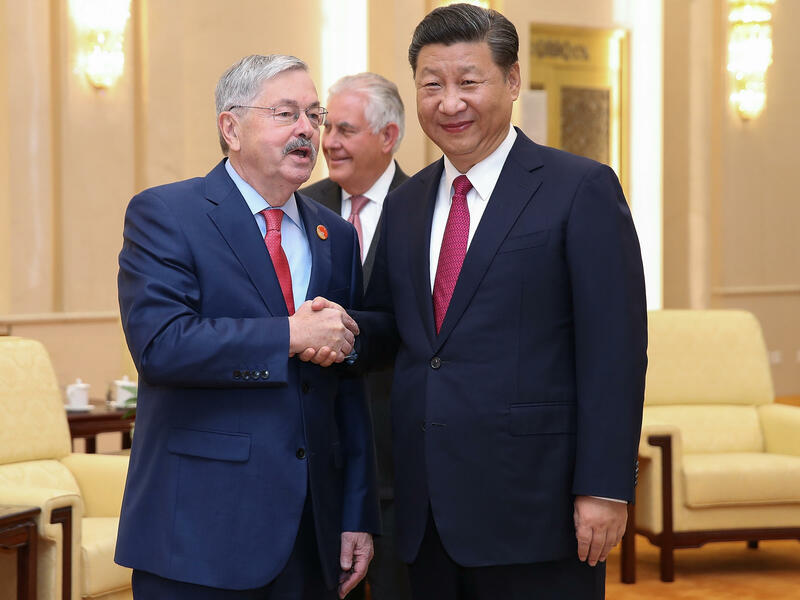 "I've been given access to more Chinese leaders in key positions, I think, than anybody here in recent weeks, and I'm hopeful that by directly and frankly conveying the concerns of our country, that will have some impact," Branstad says. Those concerns include North Korea. Branstad's just back from his second trip to the China-North Korea border since arriving here last June. China is North Korea's biggest trading partner. "And in both of those stops, I've found a very sincere effort to enforce the U.N. sanctions, and I think that's making a difference," he says. His most recent trip was to the city of Dandong, which sits across the Yalu river from North Korea. There Branstad met with local officials, who he says told him that the sanctions have "had some economic impact on their community. It's closed some businesses, and they're in the process of reducing the number of North Korean workers that are working in that area." Branstad says that cross-border smuggling in violation of the U.N. sanctions continues, and the United States and China are cooperating in trying to stop it. He adds that the two are also cooperating well on fighting the flow of synthetic opioids, such as fentanyl, from China into the United States. More than 42,000 people died in the United States in 2016 due to opioids, and the Trump administration has put the issue high on the agenda of bilateral issues with China. The drugs are often mailed from China via the U.S. postal service. "We've gotten good cooperation here from the Chinese authorities," Branstad says, but China still needs to ban the entire class of fentanyl-like drugs, to prevent new derivatives from popping up. Yet Shi Yinhong, an international relations expert at People's University in Beijing, says it will be difficult for Branstad to overcome larger trends that are reshaping the U.S.-China relationship. "He will likely have some influence," he says, "but it will probably be minor compared to the influence of President Trump, and the views of his administration members." Branstad's nomination to the ambassadorship in December 2016 helped to reassure China's government, coming just days after Trump spoke by phone to Taiwan's president, infuriating Beijing and upending decades of U.S. diplomatic protocol. Both America's and China's "leaders have strong personalities, including a certain volatility," Shi adds, "and together with structural and situational factors, these may not be advantageous to the relationship." The structural factors include China's economic rise, and the policies that support it. China recently became a net capital exporter and it is gradually phasing out the preferential policies it has used for decades to attract foreign firms. China's government continues to build its favorite companies into "national champions," to the detriment of foreign competitors, and require that international firms give China proprietary technology as a condition for market access. The pro-business camp of the Republican Party has long served to temper more hawkish policies toward China. But now many members of the camp are calling for reciprocity: treating Chinese firms in the United States the same way U.S. firms are treated in China. "I've had a number of meetings with key leaders here in China, and tried to drive home the message that the patience of the president, the Congress [and] the American business community is growing short," the U.S. ambassador says. Both sides are edging closer toward a trade war. The United States has slapped tariffs on Chinese solar panels and aluminum, and launched a wider investigation into possibly unfair trading practices. China is investigating alleged U.S. dumping of sorghum and styrene. Some observers are concerned that China could aim sanctions at the constituencies of U.S. politicians who favor getting tough on China, and thereby exact a political cost during a midterm election year. Branstad, whose former constituency of Iowa could suffer if its agricultural exports are hit, warns any such move would be "shortsighted." Shifting political forces are also changing the relationship. The United States is refocusing its security strategy away from fighting terrorism, to competing with rival great powers, including Russia and China. There is increasing support for the view that U.S. engagement with China has — not surprisingly to some — failed to nudge it in a more liberal and democratic direction. Xi has not been the reformer some had hoped. Early in his administration, he promised to constrain official "power within the cage of regulations." Instead, Xi has rolled back civil liberties and concentrated power in the Communist Party, Branstad notes. "There's tremendous surveillance that goes on of people here," the ambassador observes. "And they don't want to have any threat to their continuation of one-party rule." On the positive side, Branstad notes that Xi has made progress tackling endemic corruption and suffocating air pollution, both high on the Chinese public's list of gripes. Branstad's status as an "old friend of China" apparently gives him some latitude to broach sensitive topics with China. On June 28, a day after arriving in Beijing, Branstad raised the issue of Nobel Peace Prize laureate Liu Xiaobo, who was being treated for late-stage liver cancer. "We Americans would like to see him have the opportunity for treatment elsewhere if that could be of help," Branstad told reporters. China rejected that suggestion, and Liu died a couple of weeks later, still in police custody. This apparently has not hurt his relations with President Xi. Branstad says that when he presented his diplomatic credentials in person to Xi last summer, Xi invited him and his family to dinner. "We had that just a couple weeks ago," he says. "My wife and I, our daughter, her husband, our two grandchildren, with not only President Xi and Madame Peng, but their 25-year-old daughter." Xi's wife, Peng Liyuan is a former military officer and singer. Xi's daughter, Xi Mingze, graduated from Harvard University in 2014. Since then, she has kept — or been kept — out of the public eye, offering no clue as to whether, or how, her father has benefited from her Ivy League education.